In MOJ Digital Services we’re lucky to enjoy a strong demand for our expertise. The department delivers vital public services, which we've committed to redesigning in our digital strategy. Colleagues working across the justice system are also a great source of new ideas for how we can improve the experience of our users. While we'd like to be able to take up all these opportunities (of course), in practice we need to prioritise. To do this we have developed a set of criteria which assess the attractiveness of a potential digital project (including how much it would contribute to our aims in MOJ DS) and its achievability (how easy or difficult it would be to deliver). All the criteria are scored on a scale of 1-3, with 1 being the lowest score and 3 the highest. Projects with higher scores are assigned higher priority. If projects are tied on score overall the one with the highest number of transactions a year is given higher priority. To score the potential projects we get the digital services senior management team together as a group. 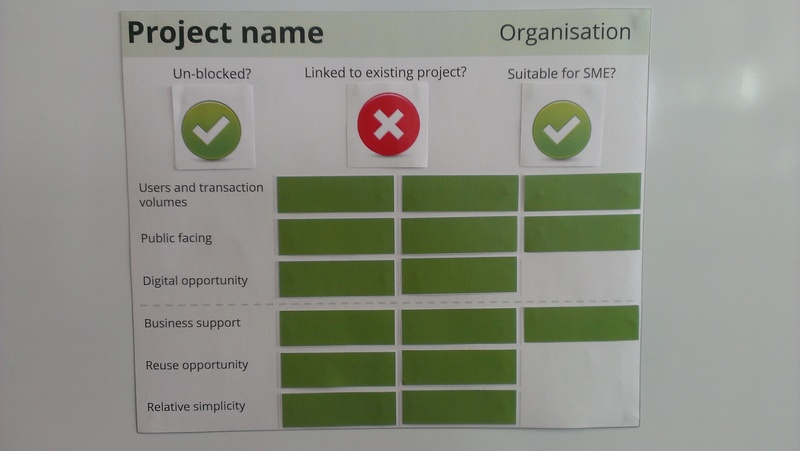 We’ve found that the best way of doing this scoring in practice is using a project card like the one pictured here. 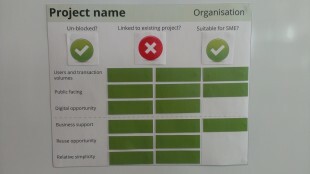 Each ‘point’ scored is represented by a green bar, which works well visually as cards that are filled up with green have better scores - it’s therefore easy to get a feel as to whether a project is likely to be a priority, compare potential projects with each other, and put them in a rank order. Another advantage of displaying this information on the portfolio wall in this way is that it is visible to the team and colleagues who visit from across the department, helping us make sure we all have a shared view of our priorities and the work that is likely to be delivered in the future.